Early Tuesday, HuskerOnline reported Nebraska signee Maurice Washington is no longer in Texas at Trinity Christian High School, but back home in California. According to the report, Nebraska is working with Washington to ensure he’ll be able to join the team for 2018. Washington, a 6-foot, 191-pound 4-star back, was one of the jewels of the Huskers' 2018 recruiting class. 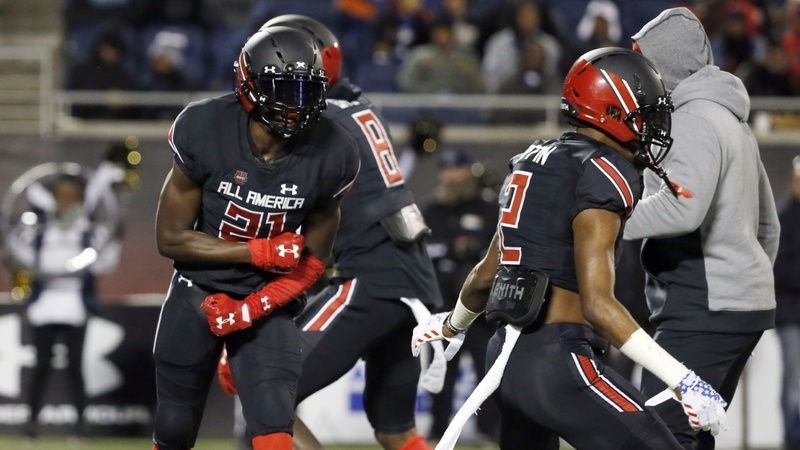 He watched his recruitment blow up nationally after being named the MVP of the Under Armour All-America Game and committed to the Huskers on National Signing Day. Now there are serious questions surrounding his future at Nebraska. Hail Varsity's Brandon Vogel, Greg Smith and Derek Peterson address what that future might look like. Should this situation merit any concern for Husker fans if Washington can’t? BV: Any time a signee isn’t able to enroll is reason for concern. Even if the school and player are committed to continuing the plan for player to play at school, not getting that player on campus as intended just opens the door for a lot of things to happen. The academic redshirt option is a potentially different avenue, but in general when a player doesn’t enroll for whatever reason I have a hard time counting them as someone on the roster going forward. I’ve just seen too many instances where this happens and that player never plays a down at his initial school. It doesn’t say anything bad about the player or school, just the way it seems to work out more often than not. GS: There should be concern at this point. Remember last summer Nebraska was in this spot with Elijah Blades but he didn’t want to even explore the academic redshirt option. It seems to be different with Washington as he is genuinely wanting to come to Nebraska plus seems to be trying to improve his academic situation. The problem is: just how much work needs to be done still? Even if he doesn’t qualify for an academic redshirt, he could be placed at a JUCO, say Iowa Western. There are options still on the table but it is time for concern. DP: I guess I’ll play devil’s advocate and say no, but a partial no. Be concerned for the kid, absolutely. By all accounts Washington wants to be here at Nebraska, therefore I want that to happen for him. That situation Brandon laid out above, a kid committing to a school and then never playing a down for that school, that’s never good and you don’t want to see it happen. But Nebraska the football team doesn’t necessarily need Washington the football player. What if he does end up joining the team? What are his prospects for this upcoming season? BV: As we’ve drawn closer to summer and it looked more like Washington might not be on campus in June, I started to downgrade my expectations for him in 2018. Getting in game shape for this offense is a different animal, and showing up in July certainly doesn’t make that any easier. So if that were still to happen it would still mean I would look at anything Washington was able to provide for the Huskers in 2018 as icing. In other words, step right up Miles Jones (and Greg Bell, Mikale Wilbon and/or Devine Ozigbo). GS: Right now, even he joins the team I don’t have any expectation for Washington to contribute this upcoming season. I agree with Brandon that getting to Lincoln in July at the earliest will make it very difficult to be ready to play college football. That adjustment will be large and need to happen way faster than I’d be comfortable with. I’d say the best case scenario is he hits the ground running as a redshirt freshman in the 2019 season. DP: From what we’ve been told, this is not an offense you can just pick up and run with. Even if he’s here, I don’t expect Washington to contribute and I think the staff would be fine with that. Nebraska will have guys to carry the ball. There’s a slew of running backs that looked good in the Spring Game (this would be big, big news for Jaylin Bradley), Miles Jones is coming and receivers will touch it. I’d rather see Frost ease Washington into things rather than forcing a kid into a situation he’s not ready for. I think Frost would rather see the same if Washington does, in fact, get here. If Washington isn’t able to play in 2018, does it dampen your outlook for Nebraska’s ability to run the ball? BV: Not drastically. It would be nice to have a big-play option like Washington available, but if Nebraska doesn’t I still think Bell is the top option. The returning backs will have a slightly bigger opportunity. As mentioned above, Jones will get every chance to play right away. And in a no-Washington future, if that comes to pass for even a year, it might mean a few extra carries for Tyjon Lindsey or JD Spielman. That’s OK by me. GS: No it doesn’t change my outlook much. I think the running game will be improved with or without Washington in the mix in 2018. This does make two particular players more important to me. Jaylin Bradley has a clear opportunity to get increased reps now. Also, Miles Jones needs to be as ready to go day one as the coaching staff hopes. It helps that he will have a defined role from the start without being the feature guy but it will be interesting to see how he handles that pressure. DP: Washington being here or not won’t affect my view of the 2018 running game. The ground game will only go as far as the line allows it. Has Nebraska added more talent to that room than it had a season ago? Yes, I like Greg Bell that much. But, there’s not going to be worthwhile improvement in the running if there isn’t considerable improvement in the blocking.